Salomon's iconic running shoe that brought speed to the trails! Light, fast, and featuring a super precisefit, the SPEEDCROSS 3 can provide the ultimate grip in any conditions. The Speedcross 3 features a water-resistant mesh upper that provides ventilation to reduce heat and moisture inside your shoes. In addition, the fine mesh prevents debris from getting trapped between your foot and the footbed. Salomon's Sensifit System cradles the upper instep, providing a precise and secure fit that promotes a natural rolling motion from heel to toe. The Speedcross 3's rugged mud and snow Contagrip outsole has a flexible chevron tread that improves grip on wet, muddy, or snowy trails. A mudguard runs along the base of shoe for protection against dampness. The OrthoLite footbed is designed with cushioning foam to reduce friction, keeping your feet comfortable as you run. EVA in the heel provides extra cushion for heel striking. The Speedcross 3's minimalistic lacing system lets you tighten laces in one pull for a customized fit. A lace pocket keeps laces secure and out of your way. 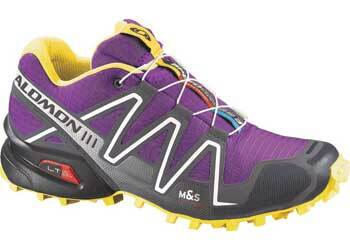 Salomon Women's Speedcross 3 Trail Running Shoe.